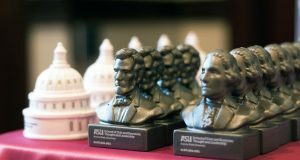 This academic year, Barrett, The Honors College at Arizona State University, is celebrating its 30th anniversary. In a few days, a record number of talented students will sit down for their first day of “The Human Event,” Barrett’s signature first-year seminar. Medical marijuana patients are free to have their drug on college and university campuses without having to fear arrest, the Arizona Supreme Court ruled this morning. The genesis for the freedom schools is the belief, particularly strong among conservatives, that institutions of higher education are liberal bastions, where conservative views on politics, economics and social issues are under assault. Claiming censorship, attorneys allege Arizona State University is illegally blocking a Muslim academician from speaking on campus because of his political beliefs. Donald Trump’s inaugural and presidency have taken aim at Americans’ shared civic faith by ignoring moral standards and bedrock principles that ground the nation. For Arizona, the bottom line is that the prison population will continue to be reduced by additional changes and the state will save a substantial amount of money over the next several years instead of continuing to increase spending without benefitting public safety. Isn’t it worth taking the extra step and reinstituting the reinvestment portion of the legislation? It will only add to the positive results we’ve already attained. Rep. Travis Grantham wants to give those on public university campuses more self-defense options, including Tasers. The bill, H2028, requires college and university students undergoing disciplinary proceedings involving an allegation of a crime to be represented by a lawyer. If the student can’t afford one, the bill mandates the college or university to provide the student with legal counsel. While the move has led some alumni to feel the school is losing its identity, school officials and former students agree that it’s a necessary step for ensuring the continued success of Thunderbird.